2017 Okanagan Fest of Ale a Huge Success! The weather didn’t dampen the spirits of craft beer and cider enthusiasts who flowed into Penticton over the weekend for the 22nd Annual Okanagan Fest of Ale. Organizers of the event are calling this one of the most successful events to date. The difficult job of determining top honours for the awards fell upon a panel of 9 industry experts including Joe Wiebe (Craft Beer Revolution), Mike Garson (Mike’s Craft Beer), Jan Zeschky (Brewed Awakening), Jason van Rassel (The Daily Beer), Jeremy Nemanishen (CraftBeerVancouver.ca), Rob Mangelsdorf (The Growler), Wade Dhooge (Cask & Barrel), Chelsea McDowell (BrewtifulBC.ca), and Rebecca Whyman, (Beernesday.com). 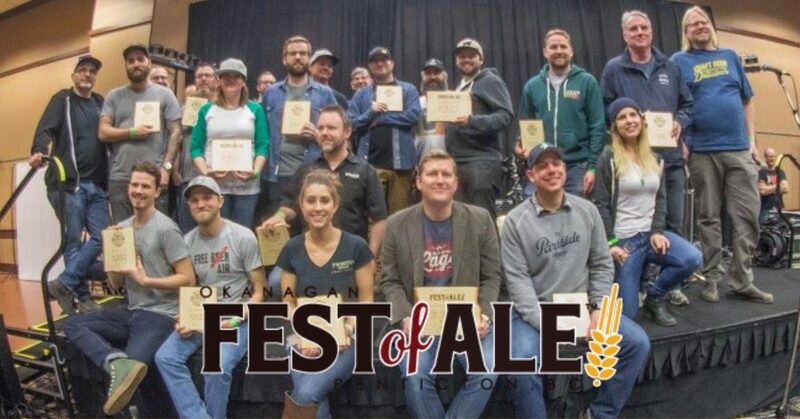 “We were thrilled to once again have such an esteemed panel of judges here with us at the festival,” says Warren Everton, Okanagan Fest of Ale Judging Chair. “They had a difficult job tasting and evaluating 121 different beers and ciders to determine the best entries in 12 different categories and then to agree on the overall Best in Show award. In addition, the People’s Choice Awards were voted for by attendees of the festival. These awards include Best Beer, Cider, and Food. Craft themed events took place around town the week leading up to the event were also well received. A number of restaurants offered craft inspired menus throughout the week featuring local breweries and we were fortunate to have Joe Wiebe offer a seminar on the Thursday night before the main event. “The support from local businesses was fantastic and we are looking to build on the success of Okanagan Beer Week™ for next year”, says Cruickshank. Not only does the festival host a venue for beer enthusiasts, but it also generates money for local Penticton charities. In its twenty-one year history, the Okanagan Fest-of-Ale Society has gifted over $577,600 in net proceeds back to the community. 2017 Charitable grant applications will be made available online only June 1 – June 30. For more information on the Okanagan Fest of Ale, visit www.FestOfAle.ca or follow them on Facebook, Twitter and Instagram.